RAISING SMOLTS – Visitors learn how young fish are cared for at the hatchery and take a quiz about basic fish needs. 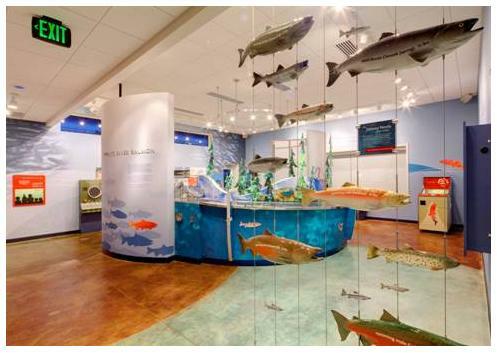 SORT THE FISH – Visitors play the part of a hatchery worker. They look for distinguishing characteristics of a fish to determine species and if it is wild or hatchery-raised. Allan Loucks created and designed the software for the entire intelligent multimedia software systems for both interactive installations, including the touch-screen and hardware interfaces for the UI.